Why are insect pests more successful in agriculture than in nature? Insect are effectively competing with humans for the food produced in agriculture and are responsible for considerable yield losses. Chemicals used to combat insects often are relatively toxic and have ecological side effects. At the same time insect pests play a clearly less dominant role in natural ecosystems. What is the reason for this difference between nature and agriculture and can we adapt natural mechanisms for agriculture? 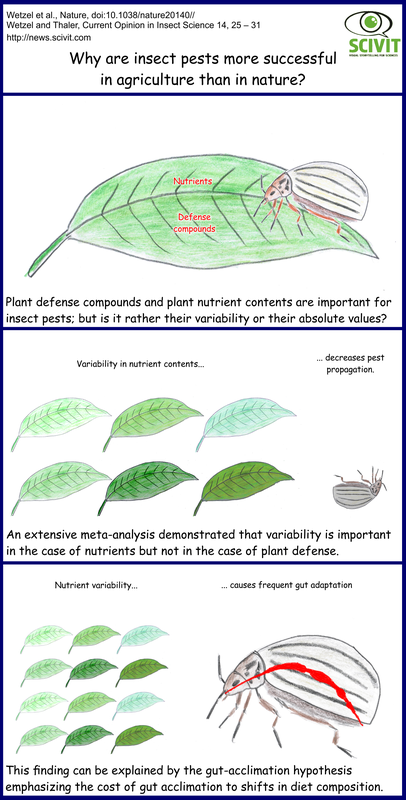 Is there an impact of variability of nutrients or defense compounds on insect pests? Plant defense and plant nutrition are two key areas affecting the outcome of plant-insect interactions. High levels of plant defense compounds result in a reduced success of insect pests. High levels of nutrients like nitrogen favour insect pests. Wetzel and colleagues additionally proposed the idea that apart from absolute levels, also variability of defense compounds or nutrients may determine insect success. To test this idea the scientists studied data from 76 scientific papers on the impact of the two factors on insect pests. They found clear signals for the importance of variability in the case of plant nutrient contents, but not in the case of defense compounds. Why could nutrient variability be important and why is it very low in agriculture? Conventional agriculture relies on the synchronous, optimized development of plants. This aim is reached by using monocultures of very similar (or identical) plant individuals. In addition mineral fertilizers are used to optimize and synchronize plant development. Plants raised in conventional agriculture therefore have very similar nutrient contents. If Wetzel and colleagues are right in identifying nutrient variability as a key parameter limiting the success of insect pests, there is a clear need to revise this central tenet of agriculture. But why should variability of nutrients in plant tissues be damaging to insects? Wetzel and Thaler argue that the gut of insects has to adapt to differing nutrient regimes and that such kind of adaptation may impose considerable costs to insects.